That’s the length of the last RFP response I worked on. Seriously. RFPs are simply one of the worst customer experiences anyone might possible encounter. They are often complex documents, requiring assemble of resources from all across an organization, are managed in a seemingly arbitrary manner by the issuer, and lack any real opportunity for the two primary parties (issuer and responder) to engage with one another. And yet, they seem to have become ever more prevalent. Why is it that something so flawed has become so ubiquitous? It occurs to me that procurement managers love them because it allows them to control the process. Initially created out of a sense of fairness, and desire to level the playing field so that viable solutions can be presented without adverse or inappropriate influence on the spending of corporate assets, the current state of the RFP process only fuels ill will. The forms required are often unnecessarily complex, and many of the web interfaces use hidden field validation so that aren’t visible when exporting online content for offline response creation. 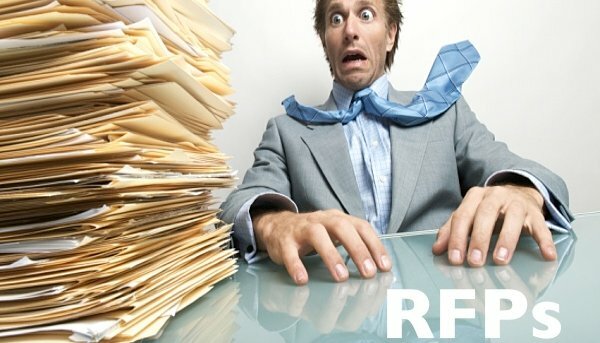 Effort to expedite RFP form design usually yield questions that aren’t relevant to the business needs, nor are they generally applicable to the submitting vendors. And to top it all off, the schedules! Some are painstakingly detailed, and either ridiculously abbreviated or so long as to defy viability. Others are vague, with no key milestones or advancement qualifications explained as to make managing resources impossible. Regardless, there is invariably a change in the schedule. One or more vendors request extensions, some evaluation team members can’t make the scheduled meetings that CANNOT be rescheduled, resulting in duplicated and triplicated efforts. Enough! If we need to level the playing field, let’s do so in favor of the needs of the business stakeholders and the driving desired outcomes. That means time, significant time, needs to be built into each RFX process to allow the end users, the business leaders, and the other related business unit representatives to explore the real needs with each prospective vendor. That means procurement needs to trust that undue influence will be mitigated by equal time and equal opportunity. In fact, procurement should be mollified that the business will be selecting the right solution that best aligns to the expressed, and the latent, business needs. If the process used to decide what vendors an organization chooses to work with is one that is driven by mutual respect, open dialog, and reduces the level of effort on all participants, imagine how good the customer’s experience might be?